Antiques expert Terry Kovel featured on Cleveland public television show Applause. Antiques lovers can link to the segment at Kovels.com. 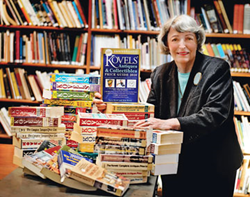 This September, author and antiques expert Terry Kovel will publish the 50th golden anniversary edition of Kovels’ Antiques & Collectibles Price Guide, the book that has become the bible of both serious collectors and weekend flea market enthusiasts. In anticipation of the 50th edition, Terry Kovel was recently featured on the WVIZ/PBS show Applause, an Emmy award-winning locally produced TV show that celebrates artists and cultural groups around Cleveland and Northeast Ohio. Terry has been a long-time supporter of public television and auctions antiques and collectibles on air for the station’s fundraiser. Kovels’ Antiques & Collectibles 2018 50th anniversary edition will be available in bookstores and at Kovels.com in September. Terry Kovel is America’s foremost authority on antiques and collectibles. She is the well-known columnist and author of more than 100 books on antiques and collecting. The 50th annual Kovels’ Antiques & Collectibles Price Guide will be published in September. The 2017 edition is currently available at Kovelsonlinestore.com and local bookstores. Terry Kovel will discuss antiques and collectibles topics with accredited media. Photographs are available. Contact pr(at)kovels(dot)com.